People suffering from seasonal affective disorder will have symptoms of depression during winter months which will subside during the spring and summer. Seasonal affective disorder is a disorder caused by seasonal variations of light. As seasons change, there is a shift in our biological internal clocks, due to the changes in sunlight patterns and the amount of sunlight. This would cause our biological clocks to be out of 'step'. Sleepiness and a increase need for sleep. Full remission from depression in spring and summer. A craving for sweet foods. Heavy feeling in the arms or legs. A theory is that melatonin, a sleep-related hormone produced in the pineal gland is the primary cause of SAD (seasonal affective disorder), since there are direct connections between the retina and the pineal gland. Thus, a lack of light would cause a direct impact to the production of melatonin. Melatonin may cause symptoms of depression and is produced in greater amount at increased levels in the dark. Another theory is that light affects receptors in the brain that produce serotonin. Serotonin levels may affect mood. When a person receives a lack of light, depression can occur. A study shows that mice incapable of producing melatonin appear to express 'depression-like' behaviors. Before going for light treatment, it is best to consult a qualified doctor. Light therapy needs time, and may need regular use. The time spent in front of the light is dependent to the intensity of the light source and the distance from the light. 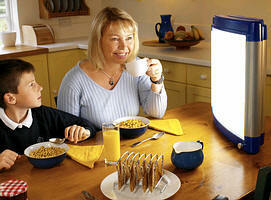 Researches have found out that light treatment done in morning or evening is most effective in treating SAD. However some people may get insomnia when using the light box in evening. Regular fluorescent lights not necessary light box will work as well, however, the light needs to strike one's eyes.